Homes inside the Canadian prairies have to work harder to protect residents from the outside elements, but who protects it? It is easy to forget about the unseen parts of your home while you are focusing on day-to-day life, so let us take care of it for you. Whether you call it an eavestrough, gutter or perimeter drain, a Winnipeg gutter cleaning is the first step toward a happy home! What Makes Gutters So Important? Maintaining a functional property requires a lot of work to both interior and exterior spaces. Ignoring a routine of assessment and care means damage to your home or workspace. Over the course of the year, your gutters can become clogged up with bits of debris and gutters become impassable. Without a proper way for your system to flush itself, items continue to collect. As leaves, sticks and needles collect, they create major issues both inside and outside of properties. Pooling water leads to leaks, flooding, mould and other water damage while damp and covered spaces are inviting habitats for insects, mice and other rodents. As annoying as it can be to have rodents living on the exterior of your property can be, having them inside is even worse! Having sitting water against the outside materials of your property can soften wooden facets, and even pull up shingles along your roof’s edge. Softened materials are easily pulled away, creating holes and allowing access into your property. The longer pests are allowed to live alongside you, the more resourceful they can become. It does not take long for these critters to find their way inside! Instead of waiting for the worst-case scenario, make your Winnipeg eavestrough cleaning a routine for both residential and commercial properties. Our specialists highly recommend twice-annual service to keep pipes clear and water running. Our Gorillas set themselves apart from our competitors through years of experience and know-how. Instead of clearing out the superficial layers of gutter blockages, we make sure to remove everything. A first-round cleaning removes top layers of collected debris while vacuums clear foundation layers. Our Gorillas don’t consider a job complete until all drains and downspouts are tested and water is free-flowing. 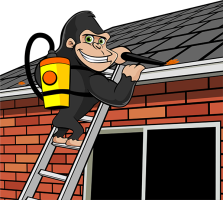 In addition to excellent customer service, Gorilla services come fully insured to protect our skin as well as your property.